Warszawa was the primary neighborhood of Cleveland’s large Polish community, named after the Polish capital. German cultural pressures in Prussian Poland and poverty and repression in Russian Poland created a wave of Polish migration. Beginning in the 1870s, America, and specifically Cleveland, became a destination for many Poles because of the relatively safe and inexpensive ocean transport and the need for workers in Cleveland's rapidly growing industries. Amasa Stone, owner of the Newburgh Rolling Mills, was one individual who recruited workers from Poland beginning in 1876. Thousands responded and moved to Cleveland. By the early 1900s Cleveland’s Polish population exceeded 35,000, one of the largest of the many immigrant groups to settle in Cleveland. Travel brokers in the city's Polish neighborhoods made all necessary transportation arrangements for Poles to connect with relatives already in Cleveland. The Kniola Travel Bureau at 3690 East 65th Street was operated by Warszawa grocer Michael Kniola. Immigration after World War I slowed greatly, because of quotas imposed by the Federal government. The Warszawa district contains a mixture of Queen Anne style two-story residences and a variety of late 19th-century and early 20th-century commercial buildings. As a whole, the buildings reflect that the immigrant community, rather than importing Old World architctural styles, adapted to the physical environments of American buildings, creating a typical turn-of-the-century American residential commercial street. 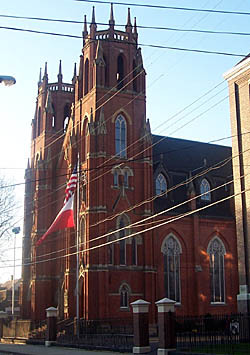 The St. Stanislaus Roman Catholic Church is considered to be the center of the Polish community. The congregation was formed in 1873 and in 1881 the congregation acquired a former potato patch for the location of their new church. By 1885 the congregation had grown to 600 and the cornerstone for the church was laid in 1886. When the church was completed in 1891 St. Stanislaus it was one of the largest Victorian Gothic churchs in the United States. A school building, designed by Brother Leonard Darscheid, was constructed in 1907. An award winning restoration of the church was completed in 1998 and guided tours are available for groups. The church is open to the public during regular office hours. 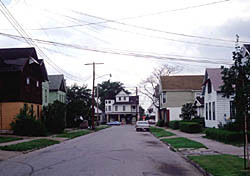 The Warszawa Neighborhood District includes four blocks of E. 65th St. between Fleet and Baxter aves., and one block of Forman Ave. east of 65th St., in Cleveland. Residences are privately owned, and not open to the public. Public buildings are open during normal business hours. A schedule of services at St. Stanislaus Church is available on its website or call 216-341-9091 for tours.